Cancel summer – 4K Curved OLED is here. Is this is the best TV on the planet? Judged purely on picture quality, this 4K OLED has a jaw-dropping combination of total black, cracking colour, judder-free video, a reflection-free curve and an innate ability to make standard-def sources ripple with realism. You can keep your Quantum Dots and your QLED, ditch your Deep Colour and go hang your HDR; OLED is here, now, and it's deserves some serious attention. The alpha male of TVs comes to us this time in a slightly smaller package than the previous OLED outing, but its 55-inches are both easier to house and much, much more affordable. It's got killer-looks to match, with a 5mm panel depth in the top 80% (the bulkier bottom area stores the electronics and speakers), blade-like chrome corners and a 10mm bezel around the panel itself. The rear of the panel is white, too, which is unusual. However, the stand is not so good. It uses a transparent plastic column that's supposed to create a 'floating look' that catches too much light to create that particular illusion. There's no swivel in the stand either, though the curved nature of the 55EG960V, along with extremely wide viewing angles, means that really isn't an issue. Aside from its OLED (organic light-emitting diode) panel, which has a 4K resolution of 3840 x 2160 pixels, the 55EG960V also adds a reflection-proof filter, which should prove handy given some of the criticisms of curved TVs. A curve in a TV is usually awfully counter-productive when it comes to the picture quality, so it's good to see some attempt to redress the balance. As well as Freeview HD digital and Freesat HD satellite tuners, WiFi and Harman Kardon speakers, LG's brand new WebOS 2.0 smart TV user interface is also on board. Just in case you were wondering (you probably weren't), the 55EG960V is 3D-ready, too, and comes with four pairs of the same passive 3D specs given out at your local multiplex. The core apps you want are here – Netflix, Amazon Instant, etc. – but LG doesn't have the widest selection of apps, or the grandest smart TV OS. In fact, WebOS 2.0 is all about mixing-up the TV's core features with sources and apps, so you'll find the icons along the bottom for the latest TV channel you watched next to the latest apps you used, and so on. Just three HDMI inputs on the 55EG960V is a slight cause for concern, though elsewhere there's no such shortages. Joining that trio on an outwards-facing side-panel are three USB slots, a headphones jack and a Common Interface slot, while below are feeds for the TV tuners, a Scart, a component/composite video adaptor, an optical digital audio output and an Ethernet LAN slot. OK, so OLED is out of reach for most of us, but – here's the good news – it is getting cheaper. This 55-inch version of LG's EG960V costs £3,800, while the 65-inch 65EG960V is priced at £6,000. 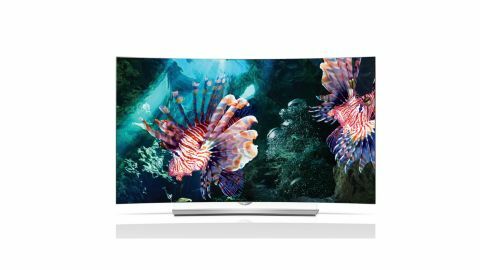 Other OLEDs in the LG stable include the 55-inch – and merely Full HD – 55EC930V and the 65-inch 4k 65EC970V. The bad news is that there's no reason for LG to drop or discount these prices because no other manufacturer is producing big-screen OLED TVs. There are some hints that Samsung is getting closer to producing OLED, but we've seen these kind of stories before. Until for-sale models appear, presume that, LG's OLEDs won't get much cheaper for at least a few years. It's also worth contemplating that the lack of competition means that the tech likely won't be developed much beyond where it is now. The flexible 77EG9900 hints at some (pointless) innovation, but that's about it, so perhaps there's no need to be concerned about that.